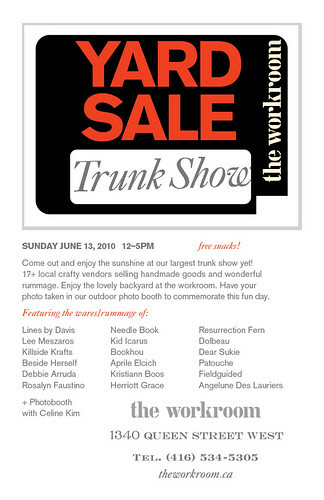 We’ve been extra busy at the shop getting ready for the Yard Sale Trunk Show this Sunday. We seem to be actually a bit giddy over having some of our favourite people all in one space for this show. Also, the talented Celine Kim will be doing a photobooth that you won’t want to miss. We will be asking for a pwyc donation towards Sketch, an art studio for street youth. The photos will be available to you on flickr after the show. So awesome. The show will be happening rain or shine, but I’m asking for everyone to collectively demand no rain on Sunday so we can hang out in the backyard with you underneath the cherry tree. fingers crossed for no rain. i really like the idea of hanging out under a cherry tree all afternoon! The news this morning said the rain should clear by afternoon, fingers crossed here too!